The origin to the legend of the Yellow Man can be traced back to researcher Norman Basile of Illinois. The earliest written record of the sighting can be found within an October of 1984 Chicago Sun-Times newspaper article where Basile is quoted as saying, "A month and a half ago, I saw an apparition standing by a tree. It was a yellow figure, a man with a hat, probably in his 40s," The author of the article added, "he took a picture of the image on 1000-speed film." Through the assistance of researcher Dale Kaczmarek, President of the Ghost Research Societyin Oak Lawn, Illinois, further details of the sighting found its way into the 1989 book True Tales of the Unknown: The Uninvited by Sharon Jarvis. During the Summer of 1984, at 10:00 P.M. Basile and one of his associates were attempting an overnight "camping" excursion within the cemetery. A few hours after their arrival, while both were standing back-to-back to each other, his associate stated, "Oh, my God! Look what's standing over there by the trees!" By the time Basile turned around it was too late, the apparition had disappeared. His associate described a man in his forties, all in yellow, wearing a suit and hat. A moment later they both witnessed "red streaking lights, and watched in disbelief as a single tree began to shake frantically." Out of fear, his associate gathered their equipment and they both immediately left the area. There was no mention of any photograph captured of the event, nor did Basile get a chance to see the apparition as it was stated within the 1984 newspaper article. Unfortunately, Norman Basile is currently unavailable for a full interview but further attempts are being made to locate him. In the meantime, it should be noted that Basile and Kaczmarek were in communication with each other during the 1980s, hence how the story found its way into the 1989 book. Since newspaper reporters have a tendency to make mistakes, and no further interviews can be conducted with Basile at this time, Kaczmarek is considered to be a more reliable source of information. Further details of the sighting were then printed within the 1991 book More Haunted Houses by Joan Bingham and Dolores Riccio. On page 143 it describes Basile's associate as a skeptic of "psychic phenomena" but agreed to come along in order to help carry camera equipment and microphones. By midnight he was "feeling quite smug and a bit sorry for Basile" due to nothing unusual occurring. That is when the apparition was sighted. Upon each of them reflecting on what the figure could have been, "red streaks of light started darting around the cemetery. Then one tree started to shake violently." It should be noted that there was at least some correspondence between Kaczmarek and the authors of More Haunted Houses before it was published. Found within a 1996 report, a woman by the name of Heather had stated, "I was starting to get bored with being there. Then it happened, I saw a man there dressed in yellow. I told my dad and he didn't see anything, neither did my friend. I couldn't help but stare at it, it wasn't a solid form but more translucent in shape, although I did see it. I can't explain exactly what happened next, but I remember leaving the cemetery with my dad and friend. Then all of a sudden, I felt something cold rush past me. I started to run, I didn't care, I wanted out of there, I had enough." There was no mention as to the exact year in which the events took place. In 2001 author Scott Markus of Illinois was conducting interviews for a documentary about haunted locations around Illinois, he had also requested assistance from the Grove Restoration Project for information about Bachelors Grove cemetery. During the same day of an on-site interview, information was divulged to Markus about a vague story of a yellow colored apparition as well as the sighting of a yellow figure which occurred during 1998. A requested was made in regard to the 1998 sighting that it not be divulged to the public out of personal interest. In 2003 the efforts of the documentary were instead turned into a book which became known as Voices from the Chicago Grave. On pages 99 and 100 it states, "one of the seldomly-reported phantoms is a man in a suit who gives off a modest yellow glow." Despite the request for privacy, it then goes on to state, "Pete Crapia, who also organizes the Grove Restoration Project at www.bachelorsgrove.com, can vouch for the validity of this tale." Markus added, "Pete saw something out of the corner of his eye. Looking at the developed picture revealed a yellow blur. 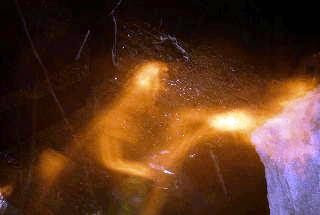 Though Pete never saw the shape of a man, he can attest to an energy source of some sort that gives off a yellow glow." The description given by Markus, however, is misleading and not entirely accurate. To help clear up the matter, what occured on October 19, 1998 was a casual visit made to the cemetery to capture scenic photographs. Due to the expense of developing 35mm film, one of the first 'economical' digital cameras on the market at that time was purchased and tested. Upon capturing a view of the Fulton monument, at the very moment the button was to be pushed, the image of a tall yellow humanoid figure was briefly witnessed with the human eye which was also within view of the camera lens. After the photograph was captured it was obvious that the playback image on the LCD screen had a discrepancy when compared to the standard surroundings. In the exact same location where the apparition was sighted, the image did show a yellow area where there was no other object(s) resembling yellow. There also appears to be what looks like a human torso with a pair of legs below it? Possibly due to the distraction of capturing a photograph at that time, there was no indication of any facial features, suit or hat with the human eye. In addition, it was not until about a year later that any story was read in regards to a yellow apparition appearing at the cemetery. Discovering the story was a shock to say the least and induced more serious consideration to the legends attached to Bachelors Grove cemetery. Although the image may have some research value for more serious paranormal investigators due to the human eye confirmation factor, it was never considered necessary to reveal it to the general public due to the low resolution caused by the quality of digital cameras at that time. It would had only of been dismissed as "something else" and would not have served much purpose. In the interest of full disclosure on the matter the photograph shown above may now be viewed for the first time in its original unaltered 320x240 format. The alternative version to the left has a circular notation to help as a guide. In response to the 2003 book, and in preparation of full disclosure to the story, you may come across a YouTube videowere a comment had been made about the sighting. For those seeking more technical details on the photograph please note that the majority of digital cameras at that time did not include features such as EXIF data. Found within a 2011 examiner.com article by Patricia Marin is a photograph that was captured in close proximity to the sighting just mentioned. During April of 2009, at approximately 10:30 P.M., Nina Jankowski of the Chicago Ghost Hunters Group in Illinois photographed an orange-yellow light next to the Fulton monument.